What is Omar doing to that poor sheep? Actually, he is learning how to “tip” a sheep at a recent livestock field school run by the New Entry Sustainable Farming Project of Tufts University. 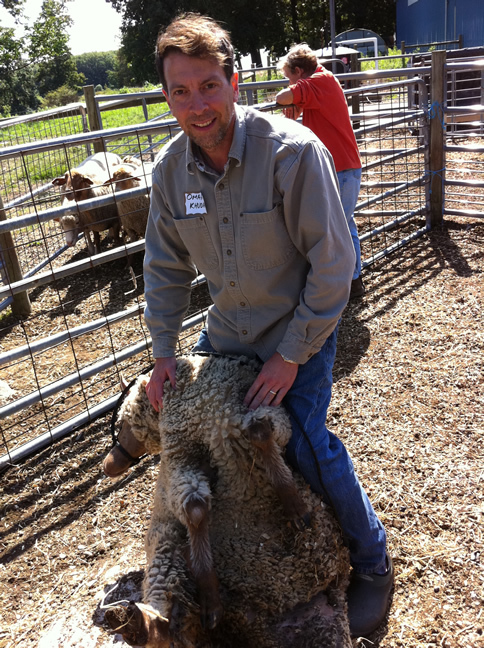 Once tipped into this pose, sheep are very relaxed and happy to lie back and let the handler trim hooves, administer a vaccine, etc. without resistance. We have had a lot of inquiries about lamb recently. We probably won’t be adding lamb to the menu right away, mainly because our perimeter fence will need major reinforcement first. But it is clearly on our minds, and we’ll get there eventually. Meanwhile, I’ll have to remind Omar not to try that on a cow.